Obituary for Alecia Michelle Johnson | Marcus D. Brown Funeral Home, Inc.
Ms. Alecia Michelle Johnson, 49, of 28 Lemans Drive in Anderson, SC, passed away on Monday, September 3, 2018 at Rainey Hospice House in Anderson, SC. 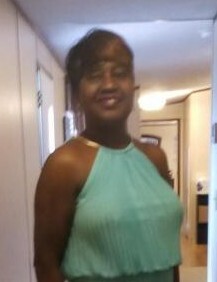 She is survived by her daughter, Briana Johnson; two sons, Rodney Johnson and Ja'Mad Kimble; one grandson, Elijah Johnson; one sister, Pamela Johnson; three special cousins, Tynnetta (Quan) Lomax, Connie Coleman, and Kimberly Watt; and three brothers, Eric Johnson, Christopher Black, and Robert Johnson. She was preceded in death by her parents, Robert and Shirley Wright Johnson and one daughter, Brittany Johnson. The funeral service will be held at 2:00 p.m. on Friday, September 7, 2018 in the Ollie Robinson Brown Memorial Chapel of Marcus D. Brown Funeral Home. The family is at the home, 28 Lemans Drive Anderson, SC 29626.